Inside: The perfect beer label design for a birthday gift for those that love their beer. A set of 6 printable’s which can easily be added to a favorite pack of beer. For those that love their beer, a pack of beer can seem like the perfect gift. That is of course if you have the perfect beer label design to go with that six pack! A beer label design can make all the difference between an average gift and a super amazing gift. We are going for the super amazing cause it’s far more exciting! So whether it’s for dad’s birthday, your husband, partner or brother, these beer labels are going to be a present that he will want to receive. Personalized gifts are always awesome to receive and this one is super easy to make. I love it when I receive requests for printable’s and one of the requests that has been coming thick and fast are for a birthday beer label design. 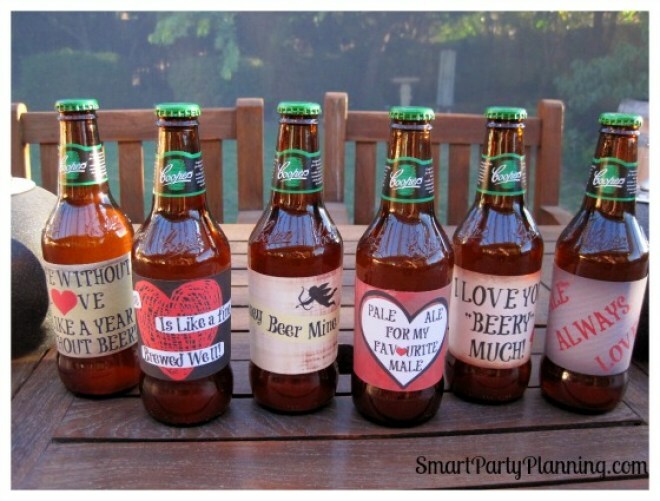 Our Valentine beer labels, Super Dad and 40th birthday beer labels are the most popular printable’s on the blog, which clearly indicates that our guys love their beer. Either that or we just love giving printable DIY gifts! I have been meaning to a beer label design specifically for birthday’s for a while, but it’s always good to be given a bit of a push. You have requested, so I have delivered. I will undertake more designs in time, but as the Valentine’s grunge labels have been popular for so long, I thought I would stick with this theme (for now). As usual I have designed six different labels which will really make that six pack look amazing. Creating the perfect six pack as a special gift is easier than you might think. Firstly, purchase a six pack of your guys favorite beer. This step is cheap and easy right? Regardless of whether this gift is for your dad, husband, boyfriend or brother, these labels are going to be perfect for him. Secondly you will need to print off the set of birthday beer labels. (Not so hard either!). Finally, cut out each of the labels and attach to your chosen beer. Hand them to him in a special hamper with some other perishable treats, or simply place back into the cardboard carton they came in. Either way, this boring old six pack has suddenly become a lot more exciting and a heck of a lot more personal, all thanks to a super cool birthday beer label design. If you havn’t already done so, you can download the beer labels instantly. This will be the easiest and cheapest birthday present you have ever given and will save you a ton of time walking around the shops looking for that perfect gift. Plus, you know your guy is going to absolutely LOVE it. My husband says it all the time “I don’t need stuff, I’d rather have something consumable that I can sit down and enjoy”. Easy! 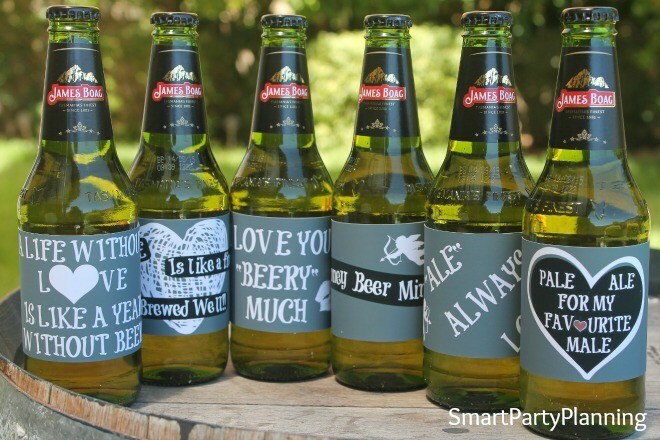 Love these this birthday beer printable design? Sign up to the newsletter so that you never miss updates on our printable’s easy recipes and party ideas. Need some help to put the printable’s on the beer bottle’s? Follow the easy tutorial to show you how. 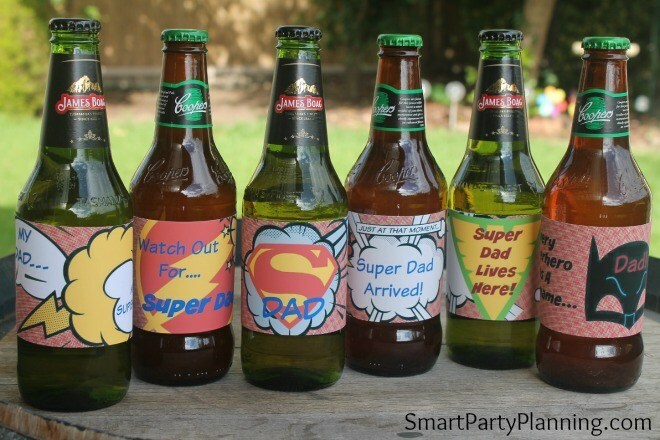 Super Dad Printable Beer Labels – These are awesome to let dad know just how amazing he is. Perfect for dad’s birthday or for Father’s day. Grungy Valentine Beer Labels – The first design we ever made for beer labels and they are perfect for Valentine’s day. Chalkboard Decorative Labels For Valentine’s Day – These are the same design as above, but in a chalk board style. 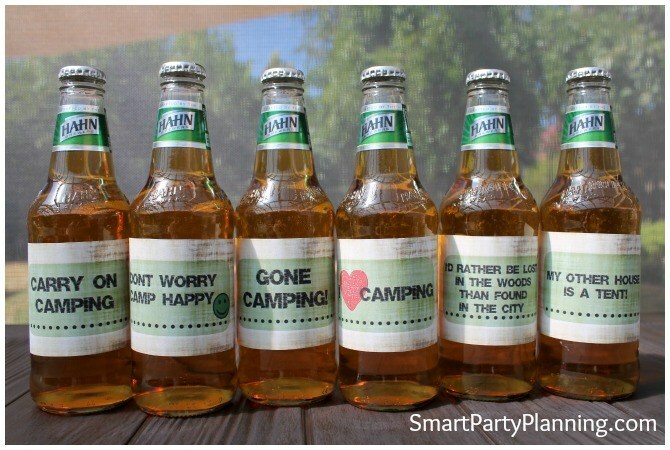 Camping Themed Beer Labels – Perfect to either take camping, or for a camping themed party. 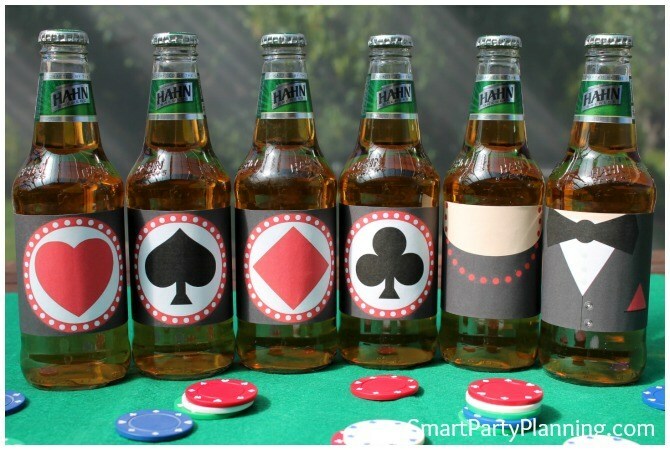 Casino Themed Beer Labels – Having a poker night? Why not theme up your beer labels. 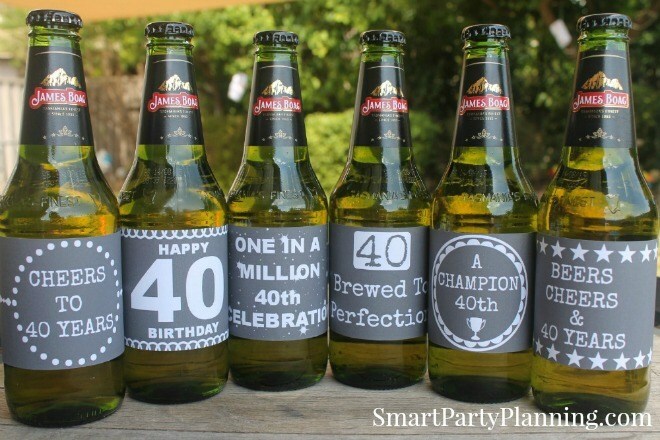 40th Birthday Beer Labels – Celebrate the big 40 with these awesome beer label designs.